This round was initially made at the request of a East Texas rancher to deal severely with the local feral pig population. He needed a round that would guarantee deep penetration and massive tissue damage. 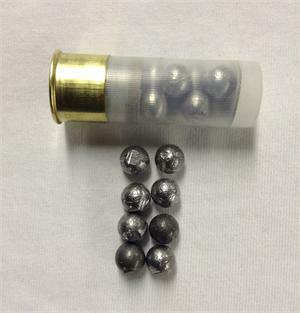 This round throws 8 massive 0000 or 4/0 buckshot at 1,200 fps through a 19" barrel which yields 2000 foot/pounds energy. These balls are .375" in diameter and weigh 78 grains a piece, or about 40% MORE than a 00 buckshot. You can easily tell by comparing the little black 00 ball in the image to the UltraBuck whose balls are bigger.